We've made a number of trips to museums during our recent trips with our last batch of visitors and our family vacation in Germany, and despite getting carted around and looking at a bunch of artwork or historic artifacts, Little Man has done remarkably well. Even when we first moved to Tilburg, before Little Man's third birthday, we were taking him through museums and old churches so that none of us would miss out on seeing well-known masterpieces and generally interesting stuff. Excited for the Cologne Cathedral! The tactic has paid off. Little Man can go through an art or history museum or an old cathedral without causing too much trouble and he does notice things and talks about what he sees. At the Rijksmuseum in Amsterdam, he was enthralled with Jan Asselijn's The Threatened Swan; at the K20 in Düsseldorf, he was fascinated by Yves Klein's untitled sponge relief in blue; and at the National Museum of Ireland's Archeology Museum in Dublin, he was transfixed by the bog-men and any artifact with an animal carved on it; not to mention that he's developed a general ability to recognize Vincent van Gogh's self portraits and sunflowers. He's learning something in the museums, and we can also enjoy the visits by talking about what we see with him. In addition to enjoying the museums, I've learned a little bit about kids and museums along the way, and I feel it's worth sharing, especially if you live close to museums. Start taking your kids to museums early. Like any other social behaviors you want to instill in your kids, the earlier you start, the better. 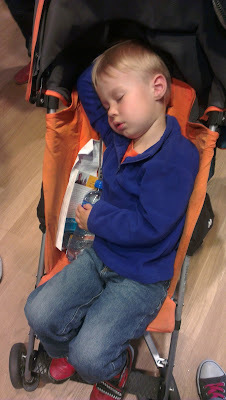 By going somewhat regularly, Little Man has learned how to act in a museum. That's not to say we don't have to remind him to be on good behavior and model it for him, but the trips are easier when you've done it before. Many museums have free admission for kids. So why not take advantage of it? While I've touted the values of the Museumkaart a few times, in the Netherlands many art museums are free for children under 12 years old so it's more accessible for families even if you don't have a Museumkaart. In Germany, we found that every museum was free for children under 6 years old, and many were free or significantly reduced for children between 6 and 12 years old. If you go in with young kids, you'll probably be followed around by at least one security guard. This is more extreme in some places than others, but on average, we've had at least one staff member follow us around while we visit their section. And it's not just that we happen to follow their walking route through the section - some are intent on making their presence known, and some are just downright rude to you because you have a kid with you. But if you just let it roll off your back (or start following the security guard to see how they like it), your visit can still be enjoyable. Bring a spill-proof cup. Museums (obviously) don't allow food or drink, but few are likely to look twice at a baby bottle or sippy cup. We strictly follow the no-food rules and don't allow snacks until we're done, but sometimes a little drink will hold a little tummy over until the end of the visit. Don't forget to find museums that are specifically kid-friendly. Because a whole day of "no touching" when you're surrounded by cool things is hard for me, nevermind a 3 year old. Don't overload your kid with art museums and test their level of self-control. Most cities with art museums have other neat museums, like a science museum or other places that encourage exploration. And you'll enjoy a change of pace, too. Yay for interactive exhibits! Using microscopes at the Zoologisches Museum, Bonn. These are such common sense ideas that no one else seems to think of! You sound like exactly the kinds of parents I'd be happy to bump into in a museum and your son is definitely going to thank you for it one day.